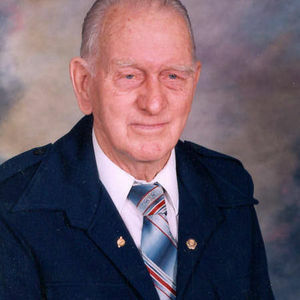 Silas M. Keeney, 94, Wahpeton, ND passed away on Thursday, May 9, 2013 at Sanford Health in Fargo, ND. Funeral services will be on Tuesday, May 14, at 1:30 PM at Evergreen United Methodist Church, Wahpeton, ND with Pastor Jenny Hallenbeck officiating. Visitation will be on Monday from 5 PM to 7 PM at Vertin-Munson Funeral Home, Wahpeton. There will also be visitation one hour prior to the service at the church on Tuesday. Interment will be at Fairview Memorial Gardens, Wahpeton. Arrangements are entrusted to Vertin-Munson Funeral Home, Wahpeton. Silas "Si" Miner Keeney was born on June 29, 1918 in Wahpeton, ND, to M. D. and Marie E. (Iverson) Keeney. He graduated from Wahpeton High School in 1936. Si joined the CCC (Civilian Conservation Corps) for about 1 ½ years where he was a cook at Mt. Pleasant, Utah. He worked on an area farm. On February 28, 1942, he joined the US Army and served in WWII in the Guadalcanal and the Philippines, before coming back to the US. Si married Louise "Red" Dawson on January 22, 1944 at Marion, Arkansas. He was honorably discharged from service on November 9, 1945. In 1945, the couple moved back to Wahpeton where Si worked for the Great Northern Railroad on bridge and depot building until 1963. The couple moved to Arkansas in 1963. They moved back to Wahpeton in May of 1989. His wife, Louise, passed away on November 4, 1995. Si has continued to live in Wahpeton. Si is a member of the VFW, Disabled American Veterans, and the American Legion. When his son was going through Boy Scouts Si (or Pops as the scouts called him) was very involved with his troop in many activities. Si was known as an outgoing people person that enjoyed going out and dancing and especially enjoyed being with his relatives. Si is survived by his daughter, Betty Joyce (William) Jones, Inola, OK; his son, Robert Keeney, Fargo, ND; four grandchildren, Cindy (Brian) Rash, Kelly Keeney, Jared Keeney, Ryan Keeney; eight great-grandchildren, Ashley Jones, Laken Clark, Kylie, Shaylie, and Tuff Rash, Alex and Shelby Royer, Colton Stevens; and several nieces and nephews. He was preceded in death by his parents; his wife, Louise; his granddaughter, Cheryl Jones; his brothers, Emmett, Chester, and Ira; and his sisters, Emma Jacklin, Elsie Keech, and Inez DeVries. The beautiful and interactive Eternal Tribute tells Silas' life story the way it deserves to be told in words, pictures and video.